Three Republican presidential candidates have filed a request under FCC’s “Equal Time” rule, demanding that NBC stations in key early voting states set aside the same amount of time for each of them that Donald Trump got when he hosted “Saturday Night Live” on November 7. Former New York Gov. George Pataki sent a request to 16 NBC affiliates, including stations in New England, South Carolina, Iowa and his home state of New York. South Carolina Sen. Lindsey Graham filed a request to NBC affiliates in Iowa, and Ohio Gov. John Kasich has asked for airtime in Iowa, Massachusetts, New Hampshire and South Carolina. Both Pataki and Graham were bumped off the undercard debate on Fox Business last week after failing to secure the minimum one percent required to be invited to the so-called “kids table.” The NBC affiliate request could help them get some of the airtime lost due to low poll numbers. Broadcast and radio stations are required under federal law to offer equivalent airtime to candidates to appear on non-news programs during an election cycle. 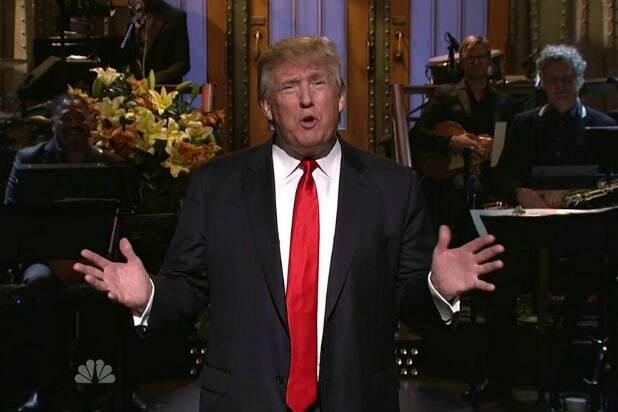 According to NBC’s tally, Trump’s “SNL” gig added up to a total of 12 minutes and five seconds of onscreen time. Opposing candidates then had seven days following Trump’s SNL episode to request that amount of time on NBC stations. Iowa and New Hampshire are key early voting states. The Iowa caucuses are set for Feb. 1 and the New Hampshire primary is a week later on Feb. 9. The Kasich, Pataki and Graham campaigns did not immediately respond to TheWrap’s request for comment. Republican presidential candidate Donald Trump hosting the show after making disparaging remarks about immigrants drew criticism and protests from over a dozen Hispanic and Latino groups. "SNL" cast member Nora Dunn boycotted the Andrew Dice Clay-hosted Season 15 episode in protest of his past jokes about women. Musical guest Sinead O'Connor also canceled her appearance. Ashlee Simpson had an awkward turn as musical guest in 2004, when she was caught lip syncing on stage. Simpson later explained that she was "sick" and advised not to sing live to protect her voice. In 1975, the show aired one of its edgiest sketches, featuring a racially charged game of word association between Chevy Chase and Richard Pryor in which the N-word was used. David Spade initiated a decades-long feud with Eddie Murphy with a seemingly innocuous joke about the former cast member being a "falling star." Spade later revealed that Murphy screamed at him over the phone and refused to return to "SNL" for years after. Elvis Costello got himself banned from "SNL" with a 1977 performance when he stopped a performance of "Less Than Zero" to launch into "Radio, Radio," a song critical of the commercialization of broadcasts. Jenny Slate's first outing as an "SNL" cast member didn't go as smoothly as she'd probably hoped. The actress accidentally dropped an f-bomb on air in her very first sketch. Host Sam Kinison had a few jokes cut from the west coast broadcast of his opening monologue in a 1986 episode when he joked about crack cocaine and the Crucifixion. Sinead O'Connor used her platform as "SNL" musical guest to protest sexual abuse in the Catholic Church. She infamously tore up a picture of the pope during a performance of Bob Marley's "War." Several performers have been banned from the "SNL" following bad behavior during their turns as host. Among them, Steven Seagal, Martin Lawrence and Adrien Brody. "Saturday Night Live" has been repeatedly criticized for a lack of diversity among its cast. Pressure on the show to diversify culminated in the casting of comedian Sasheer Zamata, a black woman, for Season 39. "SNL" has been accused of plagiarism several times. A recent sketch about three Tina Turner impersonators, featuring Sarah Silverman, Sasheer Zamata and Cecily Strong, was accused of being taken from Los Angeles comedy group The Groundlings.